Thank you to all our supporters for getting behind WWT’s work to save wetlands in early 2019. February half-term week saw record numbers of visitors at our nine wetland centres across the UK. Across the week, a massive 47,000 people enjoyed a day out among wetland wildlife. Thousands of WWT members supported three campaigns over winter – two to support laws protecting water in the UK and in Europe, and the third to urge the government to put forward a strong green Bill that will make environmental law stronger, not weaker, after Brexit. Here’s a snapshot of just some of the wetland conservation work that’s been possible in the last three months due to your support for WWT. In Iceland six Greenland white fronted geese were caught and X-rayed as part of research to see if hunting – among other threats – might be a factor in their decline. Two of the birds had shot pellets in their bodies. In total, the research has found 22 per cent of 72 birds tested had been shot at. 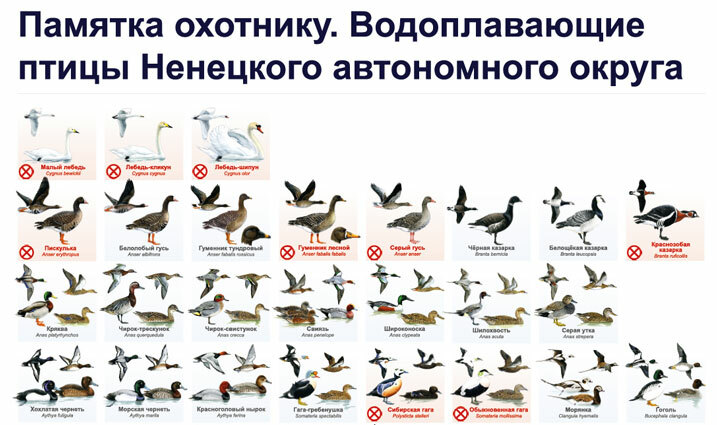 In Russia we launched a visual guide for hunters to help them identify which wetland birds are legal to hunt or not. The guide also includes details of penalties and fines, how to report ring sightings and no hunting zone maps. This work follows WWT’s Flight of the Swans expedition in 2016 where we met hunters on the Russian tundra who sometimes couldn’t identify different species at distance and didn’t know the law. In Greenland a count of resident Greenland barnacle goose population – all of whom winter in Britain and Ireland – found the population had decreased by 10.5 per cent over five years to 72,000 birds. The highest losses were found amongst those that visit Islay, which saw a 22 per cent decrease in barnacle goose numbers. In Cambodia WWT’s wetland conservation project at Boeung Prek Lapouv in the Lower Mekong region hosted the country’s national World Wetland Day event in February. We also held a multi-stakeholder event to discuss future joint management of the wetland. We are surveying how algal, plant and invertebrate communities living in lakes have changed over time. This is part of a project to gather data on how Malagasy wildlife is changing over time due to land and water practices, and hopefully help to avoid future damage to nature like the recent near-extinction of one of the world’s rarest birds, the Madagascar pochard. Work is ongoing to monitor how the 21 pochard ducklings we released into the wild in late 2018 are faring. The release received worldwide media attention, running in around 200 newspapers and in broadcast media around the world including being the headline for BBC television news. In March the ducklings experienced heavy rains and feeding stations had to be moved – but at least half of them are still visiting the feeding stations. The country’s National Wetland Guidance, which was led by WWT, has now been translated into Malagasy and published to help landowners manage wetlands more sustainably. In South Africa WWT presented the threat of birds being poisoned by spent lead-based shotgun ammunition, at a meeting of nations along the West African and West European seaboards. The nations are signatories to an international agreement to protect this important migration route for birds which runs from the tip of Africa all the way up through the UK to the Northwest Russian arctic coast. In China WWT Consulting delivered a number of training courses with Nanjing University to promote best sustainable wetland management practice to landowners and managers in the region. In the United Arab Emirates, WWT’s Chief Executive Martin Spray was elected to be the representative for six global conservation organisations – including WWT – who provide advice to the Ramsar Convention on Wetlands of International Importance. WWT’s Director of Conservation James Robinson was also elected to represent the organisations’ on Ramsar’s Scientific and Technical Review Panel. In Brussels WWT members’ responses to a Water Framework Directive consultation are being considered by the EU alongside hundreds of thousands of others from respondents across Europe. WWT’s own response outlined the importance of international laws to protect water, regardless of how Brexit pans out. In Somerset we’ve installed 10 data logging stations in two streams running off the Quantock Hills, and begun soil surveys in around 90 fields. This is part of a project to reduce the risk of flooding in the Williton area by slowing the movement of water through the landscape. In the East of England work is beginning on Phase 1 of a project to arrest the decline of one of Britain’s most endangered birds, the curlew. We aim to hatch, rear and release chicks to give an urgent boost to the struggling population in the West. Phase 2 will involve providing training and advice for other organisations looking to do similar. While Phase 3 will be a long-term research project to address the reasons why the species is declining so rapidly in the first place. In Slough trees have been removed from alongside the Salt Hill stream in order to make space for a new wetland area for the local community. Various community events were held around World Wetlands Day on 2nd February. National Planning Policy Guidance – we provided advice on improving guidance promoting the benefits of installing green, sustainable drainage systems like ponds and bog gardens in new builds. National development policy – we are broadly supporting government efforts to ensure planned developments provide a net gain for the environment, but we have also highlighted a number of issues with this approach. 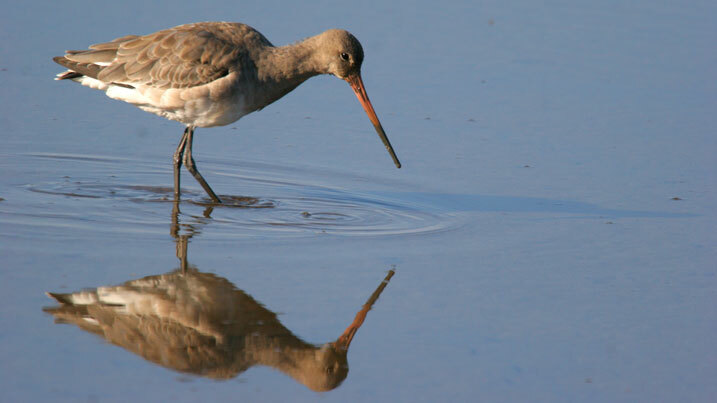 At Welney and the Nene Washes we are seeking permission to collect up to 64 eggs of one Britain’s rarest breeding waders, the black-tailed godwit, as part of a rear-and-release project to boost the species’ breeding numbers. A survey of aquatic invertebrates, bees and wasps found over 800 species including several new ones. Nest-traps have been set to investigate whether the finding of the parasitic Chrysis fulgida wasp - which has a metallic blue head and metallic red abdomen - was a one-off find or not. Work is underway on Phase 2 of its Wild Walk. The first Phase opened last year – visitors have been enjoying features including wooden beam walkways and a bouncy bridge which splashes into the wetland below. At Martin Mere a survey of in-field ditches found that different management approaches across the reserve were attracting the wide variety of biodiversity intended, including a rare finding of floating club rush which was thought to be extinct in the region. Three wild swans were fitted with a new type of GPS tracker which provides their position and height every second. Previous trackers only reported positions every hour. This will be a great help to WWT’s work to track flight paths across the North Sea in order to inform plans to build offshore windfarms. The renovated duck decoy is now open to the public. The estuary tower hide (Holden Tower) has closed in order to build a new replacement tower with better facilities. This is due to open in September before wintering birds arrive on the Severn Estuary. At Llanelli an art installation is underway to inspire visitors to think about climate change and wetland loss. We are currently sourcing a bronze church bell to house in a glass structure, the sound of which will remind people how time is running out for declining wetland species.